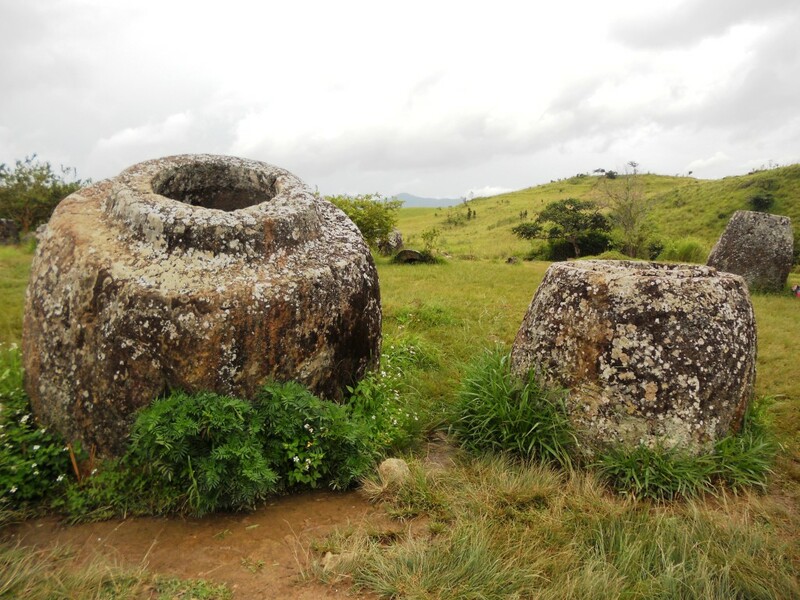 The Plain of Jars is a megalithic archaeological landscape scattered around the plateau of Xieng Khouang. Thousands of stone jars appear in clusters, ranging from a single or a few to several hundred jars at lower foothills surrounding the central plain and upland valleys. Excavation by archaeologists has supported the theory that these were used as some form of ancient burial practice, with the discovery of human remains, burial goods and ceramics around the jars. The Plain of Jars is dated to the Iron Age (500 BCE to 500 CE), and it seemed worthy of a visit. The best thing about this trip however, was all the people we met on the minibus that would take us an estimated 6 hours to reach our destination. Bob, (Australia), Nicky & Sam (England, Darn Sarf), Mellor & Chris (England, Oop North), and a quiet French guy. I would say Ozzie Bob is probably in his 60’s, and he was travelling alone and was really chatty with everyone. He broke the ice for everyone almost instantly as we all sat waiting for the driver to decide if he had enough energy to hold a steering wheel. We were ready for 8am in Luang Prebang, just as the hotel had requested, but we were eventually picked up at 9.30am and left the bus station at 10.10am. We arrived in Phonsavon, the nearest town to the Plain of Jars at 11pm. A trip which took 15 hours from threshold to threshold. What basically happened is that we reached the same landslide area we had encountered travelling on the way up. This time however, it was massive, resulting in a laborious 5 hour wait. So we just had to relax and try to be patient again. The group were quite a friendly social bunch, and the guys all grabbed a beer while we whiled the hours away discussing everything and nothing. Bob appeared at my door the following morning asking if we wanted to join him to organise a trip. So all together, this team had bonded sufficiently to arrange something collectively to everyone’s mutual financial benefit. Unfortunately, this is when you discover the Laos transport cartel’s have it all sorted, and negotiation is futile. 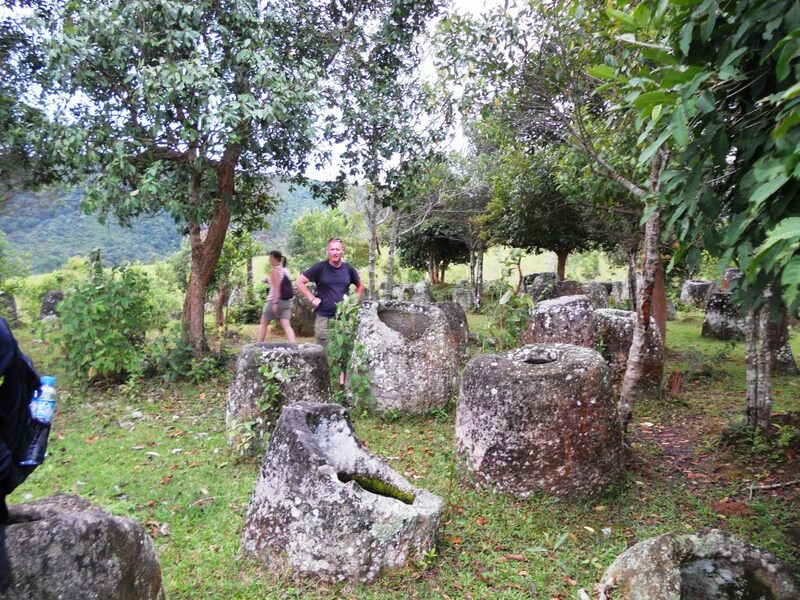 So we relented, booked the trip and were taken to the site of the Plain of Jars. Nicky, as part of the negotiations, did manage to get us all a free bottle of water. Free beer Nicky!! It’s free beer we want!! I wasn’t the first person to start to grumble about the inflated prices being charged to tourists for all these trips and other transport. It just seems so organised and transparently so, the prices just seem so apparently out of kilter, even when you compare to other Asian countries. The Plain of Jars was such a disappointment, and to be honest everyone was saying the same thing. There are 3 sites, but there is nothing extensive, and certainly no plain. With the whole hassle of getting here, transport costs, admission costs, the standard of tour guide, it just leaves you feeling slightly cheated and robbed of a few days of your life. 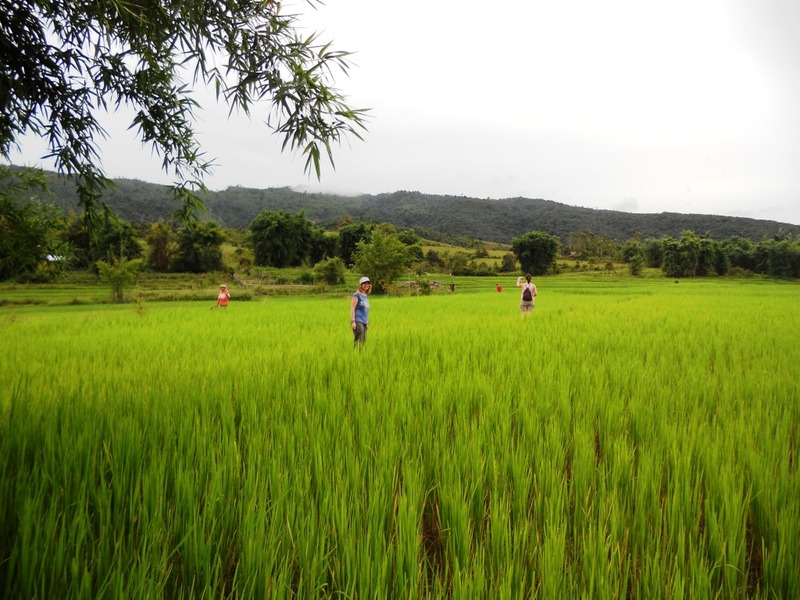 Site 3 was quite picturesque however, and we had to get across a creaky wooden bridge and go cross country through bright green rice fields to get there. It was dark when we got back to town, and we said our goodbyes to all who were leaving that night, which was everyone apart from Sam & Nicky. We organised a minibus to Van Vieng for the four of us for the next morning, and then grabbed some eats and refreshments. We were backtracking southwards, and with Michelle’s flu getting worse, would be happy just to hole out back in Vang Vieng for a few days. Sam & Nicky would be doing the tubing, but the rest of the time, we ended up hanging out together, playing pool, drinking beer, grabbing a bite to eat, playing chess and the occasional game of cards, until one night when Michelle was thoroughly bedded. On the day of the tubing, Sam returned to the hotel alone around 7pm asking if Nicky was back yet. When I said I hadn’t seen her, panic began to set in, as Sam advised he had been told that two people had gone missing in the river. Blood drained from my face, and I think I was in shock. We kept our cool, and both headed down the road, feeling numb and secretly praying that everything was going to turn out okay. That was a fraught 10 minute walk into town, and with great relief, we spotted Nicky walking up the road. We have no idea of the outcome for the two missing people, and nobody seemed to know anything about it next day. The hotel staff didn’t really seem to be that stunned when told about it, and I actually thought they looked a bit nonplussed. Maybe this is just par for the course and not big news – but something should really be done about this. There are life jackets available, but nobody seems to wear them. I’m just so greatful that Nicky was okay – it’s strange really, it felt like we had been friends/family for years, but we had only known each other for a few days. Sam and Nicky were keen to move on, and left a day before us, as we stayed back another night until Michelle felt better. This meant I would get to see Scotland play Georgia next day, and a very unconvincing win. We booked an overnight sleeper bus which was really comfy and quite cool, and we would arrive in Pakse around 6am for a stopover prior to heading to Si Phan Don – the 4000 Islands. We jumped a TukTuk from the bus station to the hotel, and enroute suddenly spotted Sam & Nicky on the corner with their backpacks on, and a Lonely Planet guide in hand. They were not supposed to be here, and by the time we had spotted each other and realised who it was, The TukTuk driver had his foot to the floor and within seconds we were halfway up the road. We wondered what to do, we didn’t know if they were arriving or leaving. The two of them appeared at our hotel some minutes later, our wee team was reunited, and after discovering that there was absolutely nothing to do in Pakse, we all went for a curry and booked our trip south for the next day.